My forays into the bluegrass world over the past couple of years have led to some interesting adventures. One of these was the opportunity to enjoy a guest pass to the 2014 CBA Father’s Day Festival, the largest bluegrass fest on the West Coast. One of the bluegrass folks I met for the first time there was Jason Winfree, guitarist/lead vocalist of popular local group Red Dog Ash, and one of the primary figures bringing live bluegrass music to Modesto and Stanislaus County. Jason began to cultivate a love for bluegrass while studying philosophy in Nashville. He spent regular evenings at the Station Inn, where he enjoyed the sounds of Peter Rowan, Gillian Welch, Dave Rawlings, Del McCoury and other notable names in the genre. After relocating to Berlin to further his studies, Jason found himself in a bar one night where the Sieker Band happened to be jamming. They invited him to join in the picking, and encouraged him to cultivate his own singing and playing. He performed a few times with this group, which has since moved to Austin, TX. Their banjo player, Rolf, even won the Texas banjo championship. After returning to the States, Jason settled in Turlock, CA, where he co-founded Bluegrass Conspiracy in 2004 with Gary Vessel, a band which later morphed into Red Dog Ash (named for a byproduct of coal fires, common in West Virginia where Jason grew up.) In addition to the standard bluegrass topics of love, loss, and murder, Red Dog Ash writes songs inspired by the history and geography of California, as well as the literary works of authors such as John Steinbeck, William Faulkner, Toni Morrison and Cormac McCarthy. One of Jason’s originals, ‘Hello Florence Thompson,’ was written about the real-life subject of the famous photograph ‘Migrant Mother.’ Florence had migrated to the Central Valley during the Dust Bowl era, and was living in Modesto when she died. In fact, she lived just up the road from Jason. The music of Woody Guthrie is also a prevailing influence over Red Dog Ash’s sound. Many of their tunes sympathize with those who are forgotten or excluded from the social order, those who have no voice. Not in a preachy way, but in a quieter kind of witnessing way. Songs linked to a specific place is another feature of RDA’s songs, another trait they share with Guthrie, as well as Bob Dylan, and the bluegrass tradition. Jason is also influenced by the vocals of Jimmy Martin, Del McCoury, Ralph and Carter Stanley, and Keith Whitley; the guitar work of Clarence White, Tony Rice, Doc Watson, and Dan Crary; and the songwriting of Townes Van Zandt, Guy Clark, and Keith Davis. Red Dog Ash’s current lineup consists of Jason on guitar and lead vocals; Gary Vessel on mandolin and vocals; Ron Cotnam on bass and vocals; and Kris Votruba on banjo and vocals. They have two CDs of original music, and are preparing to record their third. The band has performed at festivals all over California, as wells as Oregon, Nevada and Arizona. They were a California Showcase band at the CBA Father’s Day Fest, performing on both the main stage and the Pioneer Stage. They can often be found playing at the Modesto and Turlock farmer’s markets, and at venues around Stanislaus and surrounding counties. 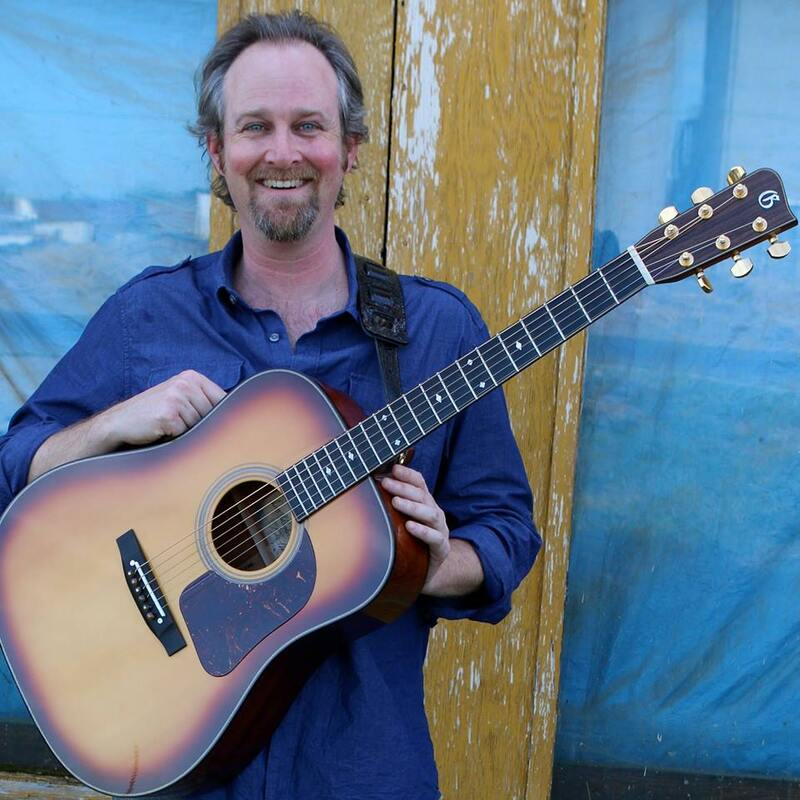 Jason also plays with Keith Davis and Vaughn Lew as Buttermilk Moon, performing Texas-style folkgrass; and is working on some sets of music with his daughter Ida, who sings and plays guitar and mandolin. Jason is also responsible (with Gary Vessel) for curating a seasonal bluegrass concert series at the West Side Theatre in Newman, entering into its third year this month. Each concert brings a different featured group, most based in California but also a few national acts. Red Dog Ash opens each showcase with a short set. This year’s run begins on January 16 with headliner Special Consensus, a Grammy-nominated band from Chicago fronted by banjo legend Greg Cahill. All concerts start at 7:30 PM. Tickets are $15 general admission, $18 reserved. Additional dates include Saturday, February 13th with High Country; Saturday, March 12th with One Button Suit; and Saturday, April 9th with Windy Hill.